Post news Report RSS	Version 1.7.9.751 Minor Updated on Steam + Sale Promotions. I am Lee Yunseok, creator of YGGDRASIL STUDIO. 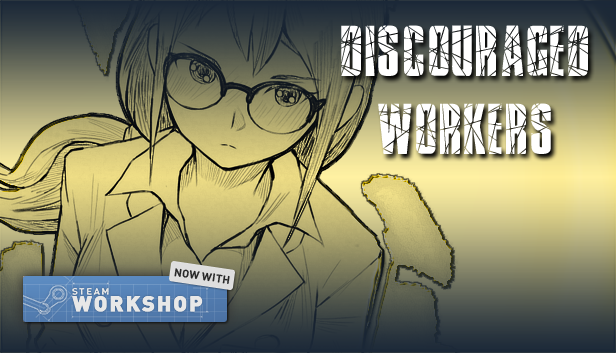 Discouraged Workers has been updated, and the sale promotions has begun. Fixed: Add height-spacing between mod boxes in the MOD screen. Fixed: Add Jupiter Hadley to manual PDF as copyright holder. Fixed: Night-room call method. A bug from V1.7.9.74 where the window displayed at the wrong coordinate value. Fixed: A bug that the Ga-yeon's walking animation in the bridge is called to the right only when the player control the Ga-yeon using keyboard or controller. Fixed: One invalid file name reported by @Gamer1214, Steam user. Improved: The code has been slightly reduced. Discouraged Workers is now officially support the Steam Workshop features. We will support creators with MOD Creator Development Kit(MCDK) and the official Steam Guide. Back to the Basic is a DLC for someone who loved the old version. It contains DRM-free builds and Android build, Extras based on V1.2.0.2. Steam: 66% off for Discouraged Workers, 72% off for KNDW Deluxe Edition. Expires on Jan 04, 2018. AppStore: 66% off for Discouraged Workers TEEN. Starts on Dec 21, expires on Dec 30, 2017. GooglePlay: 66% off for Discouraged Workers TEEN. Starts on Dec 22, expires on Dec 29, 2017. Amazon Appstore: 66% off for Discouraged Workers TEEN. Expires on Dec 31, 2017. All DLCs except MCDK will be updated within this week, and the TEEN version will be updated early next year. Thank you for read this article. I'll be back soon.